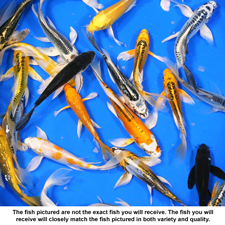 Premium Select Grade Butterfly Koi are perfect for the hobbyist that requires the best Butterfly Koi available, and is ready to spare no expense. Premium Select Grade Butterfly Koi are hand-picked from our one-year old Butterfly Koi crops, then given another year to grow and mature. These are the absolute highest quality Butterfly Koi that we have to offer, and are some of the highest quality long-fin Butterfly Koi in the world. Available from 5 to 6 inches.